(Dave) The day started out with a beautiful cruise along the coral reef coast - until we reached the mysterious. the magnificent, the beautiful White Knight coral reef. All us snorkelers hopped in with the exception of myself. It took some subtle coaxing from Matt "the Deep Sea Diver" Cameron to lure me into the depths of the coral reef. This was a first time for me - as well as for Sam - but, oh, what a feeling, drifting at the top of water, peering down into the depths of a whole another world. The coral was fascinating, filled with spikey plants to rock-like sponges and reefs. The fish were spectacular, ranging from the fat-lipped ugly-lookin' black school of fish to the brilliant yellow and rainbow fishes. It was something to be just feet away from some of these fish and coral and LIVE to tell this story. 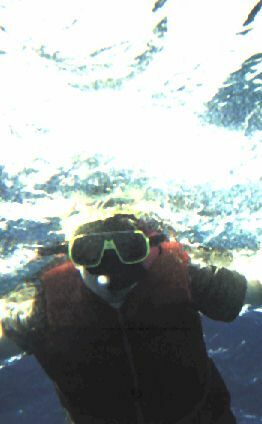 I believe the snorkeling was one of the better experiences (sorry, Chris!) of the trip up until this point. I believe our motley group of six all had a wonderful time out there with the fishes. It will be an experience hard to forget. Now, I'm handing the log to Matt to tell you - the reader - more about this spectacular day. (Matt) Thank you, Dave. There was so much to see and tell about, I can't hope to even give you a glimpse of what we saw. The morning started to pick up when our leader's, Hubert's, girlfriend showed up. She was beautiful, slim, foreign, and had a great laugh. The boat ride was magnificent, cruising over the crystal calm water, catching glimpses of fishes. I had a great time talking to the scuba divers and listened in on their briefing and found out the general layout of the reef and what there was to see. We arrived and the boys jumped in and took off while Dave and I waited for the life-jacket. I was glad of the wait because Vienna (as we called Hubert's girlfriend) hung around and helped get Dave used to snorkeling a bit. What a combo! Beautiful girl, beautiful water, myself, and Dave. Well, the first adventure was Dave's fault, but I was glad of it. He had mishapped to drop his snorkel overboard and it perchanced to sink its merry way to the bottom. He spotted it on the sea floor (some say 30', others say 40') below and I made a valiant effort to retrieve the aforementioned item but without success. Vienna was informed by Dave of our situation and said that I could get it, since I was a "great diver." Well, that is all I needed; to be goaded into going deeper than I thought I could because a beautiful girl I DID NOT KNOW said I could. I dove for it nevertheless and lo and behold, I got it! I only burst my right ear drum in the process. We all paddled about pointing, taking pictures and diving down to look at something or another. It was the best! Towards the end of the day, Sam and I thought it was time to go back to the boat and so we took a short cut over the top of the shallow reef (3'). We soon realized that there is where we should have spent the whole day. Magnificent. We felt like our bellies were going to scrape the reef because the water was so clear. 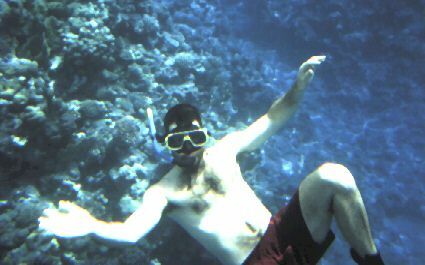 We often came over holes in the reef going sometimes down only a few feet and at other times all the way to the sandy bottom (15'). There were scores of fish there coming in and out of the sunlight, showing off their colors for us. They were like beautiful women in finery that know when and how to look magnificent for you and parade in the lights to tease your eyes. Some were in schools, some alone, and often they would move in two's. Side by side in the watery sunlight. Toward the end, I was feeling cocky and swam down to the divers and along with them for a minute. I would guess the lowest I went was 40'. I could have gone lower but it is kind of scary being so far down alone. On the way back to the dock, Sam and I spoke with Vienna (26) and Hubert (36) about their lives and adventures, but you'll have to read their log to get the details. Save it to say, he quit his job 10 years ago (at age 26, like me) and sold his house and has been on "walk about" ever since. They were great. She was amazing. We went back to Pigeon and split up to find food, taxi, and pay for the room. I found a taxi to take us to Katurine (St. Catherine, Mt. Sinai) for 200 pounds. We got our dinner to go and were off. We thought it was a 1 1/2 hour drive, but it was 3 1/2 hours. Through the most desolate piece of land I have ever dreamed of. I was incredibly hot. The wind in the open windows felt like the blast of heat that hits your face when you open the oven door (after it's been on a while, of course). We arrived at St. Catherine's, hoping to see the monastery that evening, climb Mt. Sinai for sunset and go to Eilat that night, but fortunately we did not. When we arrived the monastery was closed and it was too late to make Sinai for sunset. So we cooled our jets a bit. 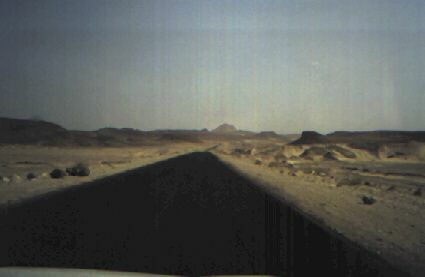 I settled a deal with our taxi driver "Jake" to spend the night in Sinai and take us to Eilat the next day. So we got a room for the six of us at the monastery (breakfast and dinner included.) Waited around for dinner, then ate like kings. Chicken and spaghetti. Man was it good - tons of cold water too. We all ate well and went to bed. The plan was to get up at 2am and hike to the top of Mt. Sinai for the sunrise.